Sir James Barr made a speech The Future of the Medical Profession on 21st September 1918. The answer was eugenics. What Barr was saying, in effect, was that the misery and suffering caused by tuberculous deaths did not outweigh the eugenic benefits it had on British racial stocks. That TB had value as a lethal, and legal, means to eliminate the so-called “unfit”. 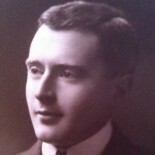 Dr Halliday Sutherland disagreed, not because he had been “blinded by sentiment”, but because he realised that Tuberculosis was primarily caused by infection, not heredity. In 1921, Barr wrote to Dr Marie Stopes to congratulate her on the opening of a birth-control clinic in a poor district of London. The restriction in the reproduction of undesirables was to be achieved by the provision of contraceptives (Stopes’ own “PRORACE” brand). “You and your husband have inaugurated a great movement which I hope will eventually get rid of our C3 population and exterminate poverty. The only way to raise an A1 population is to breed them.” [“A1” and “C3” were categories assigned to men who sought enlistment in the army. A1 was the very best, and C3 described the worst, unfit to serve on mental and physical grounds]. Barr became a Vice-President of Stopes’ Society for Constructive Birth Control and Racial Progress and he testified for her on on the first day of the Stopes v. Sutherland libel trial in 1923. This entry was posted on 27 February 2018 by markhsutherland in Consumption, Eugenics, Sir James Barr, Tuberculosis.